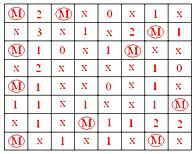 In worksheet on number puzzles and games the questions are mainly based on number puzzles and number games. Hints are given after each and every question to guide the students so that they can easily solve the questions. 1. 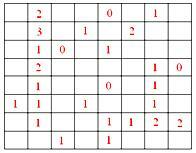 In the following grid, fill up the numbers from 2 to 9 (repetition not allowed) such that there occur only two numbers in each row and also in each column. The product of the two numbers must be equal to the number given in the margin. Hints: Begin by placing the lowest number, i.e., 2, in the square corresponding to the two smallest multiples of this number (i.e., 2) in the margins. Trick: Sum up the numbers in the column which is completely filled with numbers. Proceed with completing the row or column which has three numbers and only one cell empty. 3. In the following triangle, fill in the numbers from 0 to 8 (without repetition) in the nine circles so that the numbers on each side of the triangle add up to 13. Trick: Put 0, 1 and 2 at the three vertices of the triangle. 4. 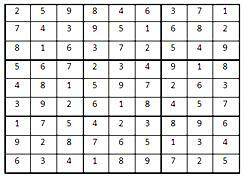 In the given 3 × 3 grid, arrange the digits from 1 to 9 (without repetition) such that the sum of the numbers surrounding any cell is a multiple of the number in the cell. Note: There is only one possible arrangement, except that any of the rotated forms of the above arrangement may be displayed. In the magic box there are 10 hidden mines. Around the numbered square the total number of mines hidden in the 8 squares, indicates the numbers in various squares. Now you have to find 10 mines. Hint: There is a mine in the lower-left corner. 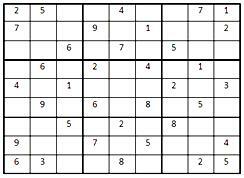 Trick: First cross out all empty squares around the squares numbered 0. Then, begin by using the Hint (provided in the question). In the 4 x 5 array given below, place the numbers from 1 to 20 (without repetition) so that a sequence (chain of numbers) is obtained from 1 to 20. You can move to the adjacent cell to the left, right, up or down but not diagonally. The positions of the numbers that already exist are fixed. 8. In the following problem, replace the letters of the English alphabet by digits (two or more letters may have the same value) to complete the procedure of the division. Explanation: Each number is equal to the product of the two nearest numbers in the row just above it. 10. Insert ‘+’ and ‘-’ symbols between the numbers so that the equations become correct. 11. Find two numbers whose product is a one-digit number and the sum is a two-digit number. 12. Find three whole numbers whose product and the sum are equal. 13. Find the digits x and y (x > y) such that the five-digit number 19x9y is divisible by 36. Explanation: A number is divisible by 36 if it is divisible by both 4 and 9. Now, for 19x9y to be divisible by 4, we must have y = 2 or a = 6 (since the number formed by the last two digits must be divisible by 4). Also, for 19x9y to be divisible by 9, the sum of the digits must be divisible by 9. Therefore, when y = 2, then x = 6 and when y = 6, then x = 2. Since, x > y, we have x = 6, y = 2. 16. Solve the following cryptograms . Students can increase their mental math calculation by practicing the worksheet on number puzzles and games.